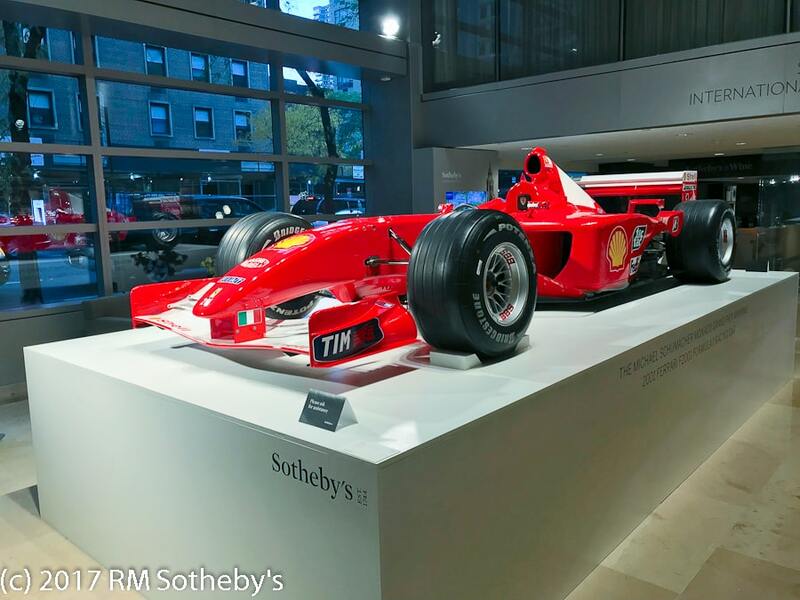 RM Sotheby’s returned to Sotheby’s mother ship on York Avenue in New York City for its second time on December 6, 2017. 2013’s RM auction at Sotheby’s headquarters had been very successful, and the sale here in November of Michael Schumacher’s Monaco and Hungary winning F2001 Formula One car for an attention-getting $7.5 million just three weeks before demonstrated the viability of presenting a curated selection of fine automobiles during Holiday Season weeks in the Big Apple. Money does seem to grow on trees in NYC (or at least in the boroughs of Manhattan and Brooklyn) and RM Sotheby’s is practicing up on how to get more of it for itself. This year’s sale was styled “ICONS” (yes, all caps) and for the most part the vehicles offered were, or are becoming, or might be, iconic. Sotheby’s offered a week’s worth of luxury lifestyle auctions with watches, jewelry and even some lively Tiffany glass to complement RM Sotheby’s cars. Attractively displayed in Sotheby’s 10th floor gallery the ICON sale’s highlight was a Ferrari 250 GT Long Wheelbase Competition Spider. 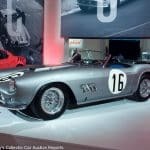 It had sold in 2007 at RM’s Monterey auction for $4,950,000, then had extensive work done to it, but few if anyone in the room Wednesday evening were prepared for a pitched battle between two bidders that brought a final successful bid of $16,350,000, $17,990,000 with the buyer’s commission. The commission, by the way, represented a change for RM Sotheby’s with a 12% rate on the first $250,000 bid and 10% on anything above that. The commissions in the report below reflect that with some odd-looking rates. 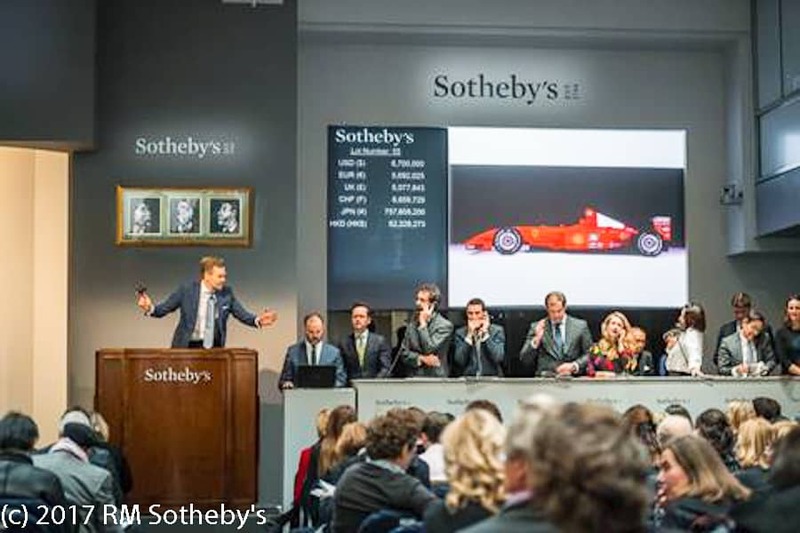 It’s another sign of the action now going on within RM Sotheby’s to try to gain an advantage from the relationship between the two entities and to position fine, fast, beautiful automobiles within an art and collectible context. Based on the results of this sale and the F2001 sold last month it’s working. 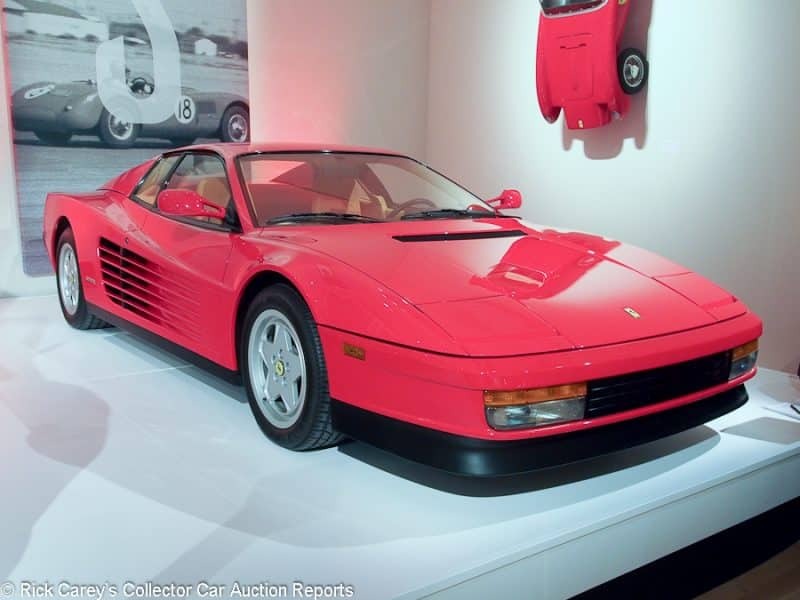 Lot # 120 1989 Ferrari Testarossa Coupe; S/N ZFFSG17A3K0080908; Engine # 17045; Red/Tan leather; Estimate $250,000 – $325,000; Unrestored original, 2 condition; No Reserve; Hammered Sold at $220,000 plus commission of 12.00%; Final Price $246,400 – Air conditioning, Eagle tires. – Like new with 586 miles. Belt serviced in 2006 and 2015, undriven since. – Opened at $120,000 and closed at this extraordinary result even though it is below RM’s low estimate. Before being driven it will need another complete belt, hose, fluid service and thorough checking, but it is unlikely ever to be driven farther than on and off a transporter. Even that is hazardous without extensive service before firing it up each time. This is a $100,000 premium for originality and negligible miles. Hammered sold to the same bidder number as the buyer of the ex-Steve Jobs BMW Z8. 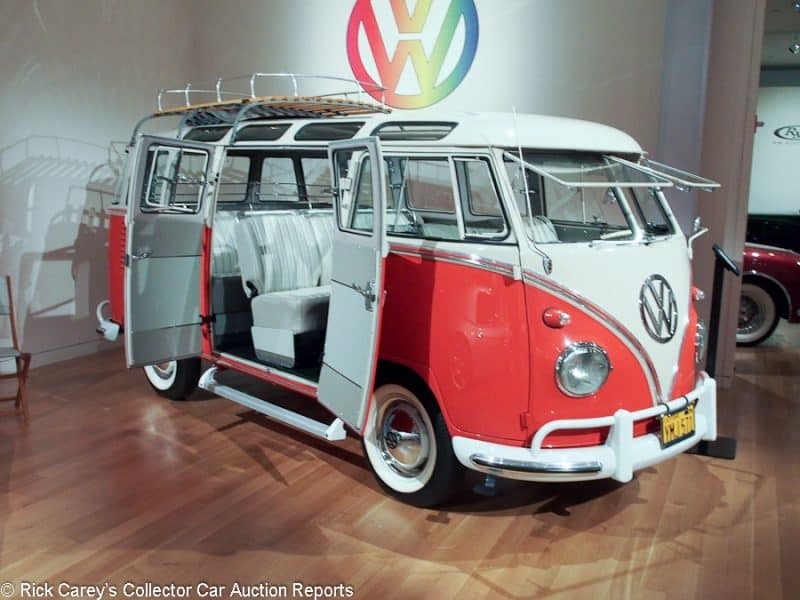 Lot # 121 1960 Volkswagen Type 2 Deluxe Microbus 23-window; S/N 686862; Engine # 5925263; Peach, Cream/Cream leather; Grey leatherette sunroof top; Estimate $150,000 – $225,000; Recent restoration, 2+ condition; No Reserve; Hammered Sold at $185,000 plus commission of 12.00%; Final Price $207,200 – Folding sunroof, wood slat roof rack, Sapphire radio, shift lever extension, Safari front windows, bumper overriders, hubcaps, whitewalls, mud flaps, 3-row seating. – Freshly done and better than new in all respects but with a replacement engine. – Seriously over-restored but impossible to resist, no one should be surprised at the eye-opening price this 23-Window brought here in NYC. Appalled might be a better word, but not surprised as the 23-window with folding sunroof and roof rack is prone to stimulate passions and overcome rationality. This would be a world record, except B-J beat it by $95,000 this year in Scottsdale … for a 21-Window. 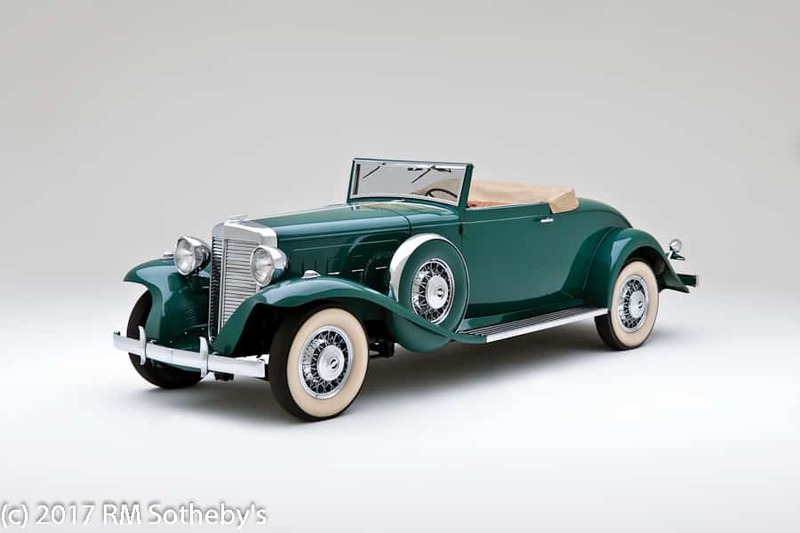 Lot # 122 1932 Marmon Sixteen Convertible Coupe; S/N 144859; Light Green/Beige leather; Beige cloth top; Estimate $1,000,000 – $1,200,000; Older restoration, 3 condition; With Reserve; Hammered Sold at $870,000 plus commission of 10.57%; Final Price $962,000 – Chrome wire wheels, wide whitewalls, dual enclosed sidemounts with chrome rings, Depress Beam headlights, rumble seat. – Restored by Harrah’s, sold to General Lyon in 1987, then to the present owners in the 1990’s, still with its intact Harrah’s restoration from a generation ago. Generally sound older paint, chrome and top. Surface creased upholstery. Small edge and door hinge chips. Chassis is dirty and scraped with some surface rust showing at edges and joints. Cracked and torn windshield gasket. Rust bubbles under the paint on the windshield posts. Orderly but aged engine compartment. A sound but aged and used older restoration. – Almost as exciting as the limited ownership history of this Marmon Sixteen and its Harrah’s Collection provenance, at least to serious car geeks, is that it comes with its original Harrah’s history and research file, the gold standard for documentation that few more recently restored automobiles can equal. For provenance, quality, style, performance and a now generation-old restoration that, despite its flaws, still is sound and usable, this is a landmark car which brought an appropriate price. 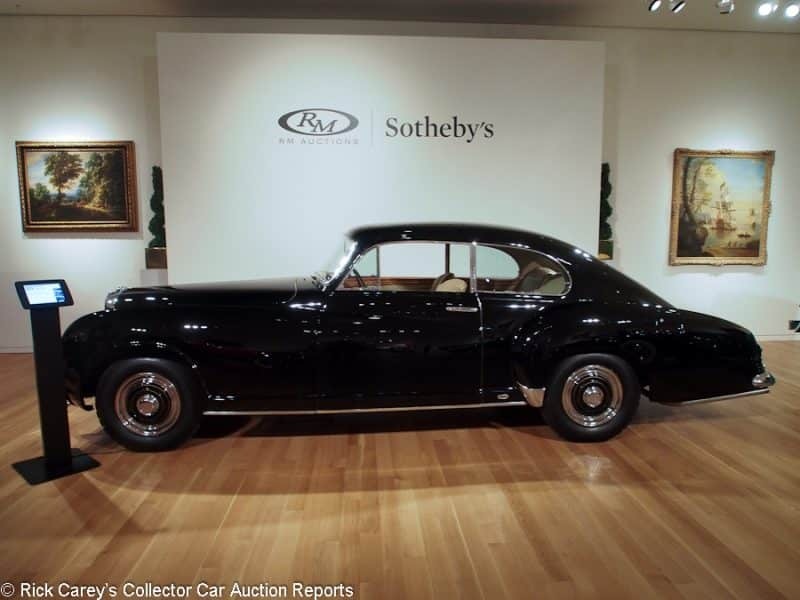 Lot # 123 1954 Bentley R-Type Continental Fastback Sports Saloon, Body by Franay; S/N BC51LC; Engine # BCC50; Black/Beige leather; Estimate $1,000,000 – $1,300,000; Older restoration, 3+ condition; With Reserve; Hammered Sold at $980,000 plus commission of 10.51%; Final Price $1,083,000 – Marchal head and foglights, multiband radio, wheel covers, central 4-speed gearshift, burl walnut interior trim, S1 cylinder head and 2-inch SU carbs, tools, Touring Spares Kit and jack, original cylinder head and intake included FOB Massachusetts, extensively documented. – One of five Bentley Continental R models bodied by Franay, but the only LHD fastback and the only 4-speed, once owned by professional golfer Gene Littler. Attractive older paint, interior and chrome. Mechanically rebuilt by Vantage Coachworks in 2010 or so. Very good interior wood, surface creased upholstery. Old undercoat in the wheelwells. Cracked windshield seal and scuffed chrome trim. Some small paint cracks and touched up hood edge chips. – There are a few subtle details that distinguish Franay’s Continental Sports Saloon from H.J. Mulliner’s, but not a lot: an accent line here, more restrained rear creased rear fender there. The Mulliner cars are encroaching upon $2 million and this is the same performance and nearly indistinguishable design for 40% less, not to mention greater rarity. It was offered in Tokyo in 1992 where it brought a bid of $261,998, then sold at RM’s Monaco auction in 2014 for $963,410. That was Euros 700,000 at the time against Euros 910,000 here, a small difference in dollars today, but a handsome margin for a Euro-based seller – except the seller here bought and sold in dollars. Charging across the Continent, or through the open spaces of the U.S. on a something-Mille or -Grand the difference between this and a Mulliner-bodied R-Type Continental will be invisible; the value of this purchase will continue to reward the new owner. 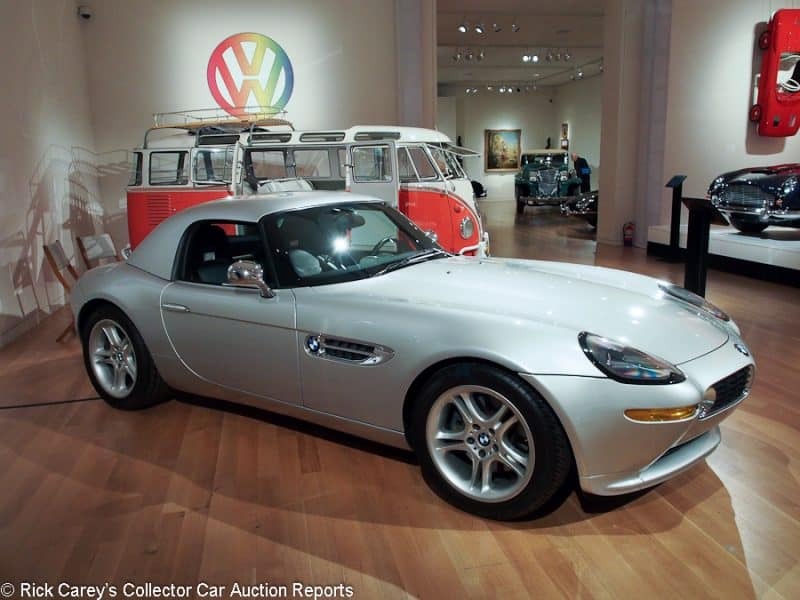 Lot # 124 2000 BMW Z8 Convertible; S/N WBAEJ1340YAH60085; Titanium Silver, Titanium Silver hardtop/Black leather; Estimate $300,000 – $400,000; Unrestored original, 2- condition; No Reserve; Hammered Sold at $295,000 plus commission of 11.69%; Final Price $329,500 – 18 inch alloy wheels, Kumho tires, CD changer stereo, two tops, 5-speed, BMW-badged Motorola StarTac cell phone. – Ex-Steve Jobs with copy California ‘pink slip’ in his name. Three owners from new. Chipguarded nose, very good original paint and interior. Chassis and underbody are lightly used, caliper paint is peeling off. The odometer shows 15,199 miles in the catalog and are probably all it’s accumulated since new. – Encouraged, so it is said, to buy the Z8 by Oracle’s Larry Ellison, Steve Jobs got a Motorola StarTac flip phone in the bargain. Seven years (and much tumult at Apple) later the world got the iPhone. Whether there is a connection between the make-telephone-calls-only StarTac and the 2007 Apple iPhone is unclear, but potentially not insignificant making this a possibly important cultural milestone. Z8 prices wandered erratically upward until in recent months making a major jump. This isn’t a record, but it’s close, a result that combines the Steve Jobs mystique with the design and performance of the Z8, particularly for one with 15,000 miles on the odometer. It was sold to the same bidder number as the Ferrari Testarossa, an intriguing combination. Lot # 125 2016 Ferrari F12tdf Coupe; S/N ZFF81BFA0G0219337; Rosso Dino, Black accent/Black Alcantara; Estimate $1,100,000 – $1,400,000; Unrestored original, 2 condition; With Reserve; Hammered Sold at $1,000,000 plus commission of 10.50%; Final Price $1,105,000 – Black 20 inch alloy wheels, PZero Corsa tires, carbon exterior and interior trim, carbon seats, suspension lifter, front and rear cameras, passenger display, big stereo, SF shields. – New car with 398 miles. Under warranty until July 2019, factory maintenance program until 2023. 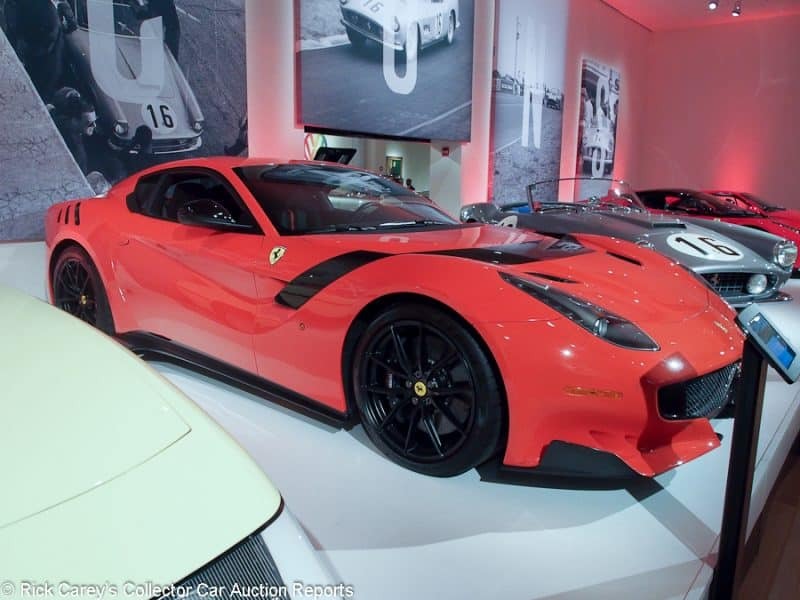 – Special ordered in the Blood Orange color of Rosso Dino (a color that looks a lot better on a Dino 206 GT than on this extravagantly carbon fibre embellished F12tdf) the seller may have been taken aback when it arrived which might account for the under 400 miles on its odometer. It is distinctive. It isn’t attractive. The seller should be satisfied to see it on its way to someone new at this price, more than double the value of a plain F12. 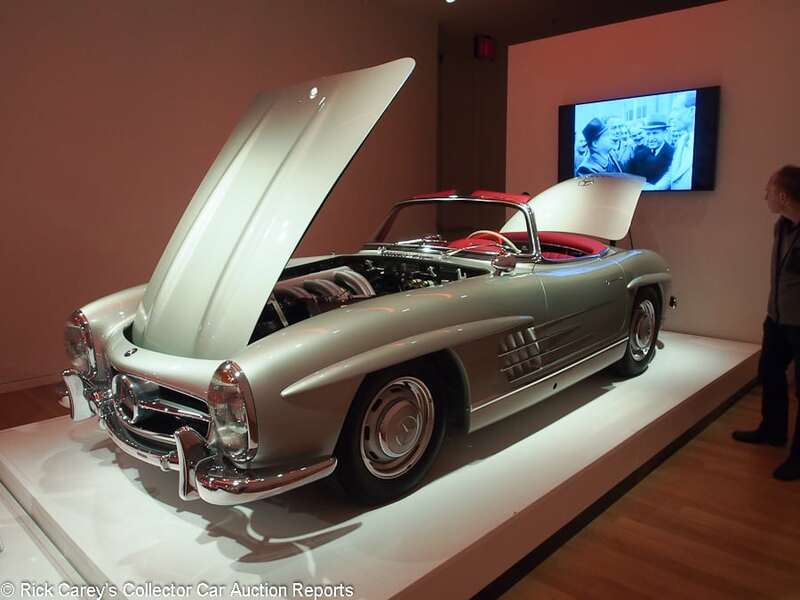 Lot # 126 1958 Mercedes-Benz 300SL Roadster; S/N 1980427500649; Engine # 1989817500672; Silver Grey Metallic/Red leather; Black cloth top; Estimate $1,250,000 – $1,500,000; Recent restoration, 2+ condition; No Reserve; Hammered Sold at $1,275,000 plus commission of 10.39%; Final Price $1,407,500 – Becker Mexico radio, body color wheels with polished alloy rims, 185VR15 Michelin XVS tires, Ivory steering wheel and shift knob, Euro headlights, fitted luggage. – Very good clearcoat repaint, excellent interior, carpets, chrome and glass. Small scuff just forward of the right door. Underbody and engine compartment are like new. Restored in 2015 by Rudi & Company and about as good as it gets, other than the minor paint scuff and a change to Euro headlights. – An impressive car, done to very high standards, and it brought an equally impressive, but deserved, price. 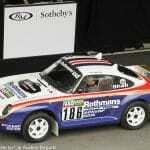 Consignors brought cars to RM Sotheby’s in New York in search of lightning-strike results. The bidders, as evidenced in this result, weren’t so taken with the opportunity to spend money freely. This is a right car at the right price. 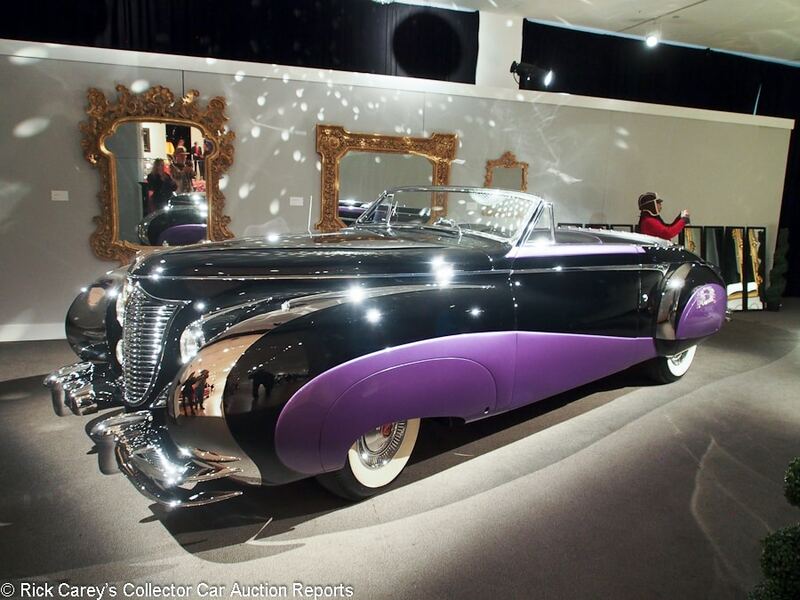 Lot # 127 1948 Cadillac Series 62 Cabriolet, Body by Saoutchik; S/N 486237307; Engine # 48623707; Black, Violet/Black, Violet leather; Estimate $850,000 – $1,000,000; Older restoration, 2- condition; With Reserve; Hammered Sold at $775,000 plus commission of 10.65%; Final Price $857,500 – One of two built by Saoutchik with similar coachwork, this one for Louis Ritter, a New York furrier, the other for Dolores Del Rio. Fully enclosed wheels front and rear, beautifully blended fender and body contours. Power top fully retracts under a hard boot cover. The usual Saoutchik chrome accents. Automatic. – Concours restoration with great paint, interior and brilliant chrome but now showing age. Vent windows delaminating. Doors puff and rear edge is not even. A spectacular showpiece that is surprisingly attractive even on the gigantic Cadillac chassis although the grille, lights and bumpers are contrived. – Sold by RM at Monterey in 2006 for $649,000 then by Gooding in Scottsdale in 2010 for the same price and its odometer has added only 49 miles since 2006. Artfully displayed by RM at Sotheby’s in a separate room where it towered over ‘Goldie’ the Austin-Healey 100/6 but made a dramatic impression. That may account for the generous price that overlooks the edgy old restoration’s condition. It also sparked many comments like, ‘Wouldn’t I look great driving that to the country club’ and it will be eye-candy on the streets of New York or cruising the Hamptons next summer. 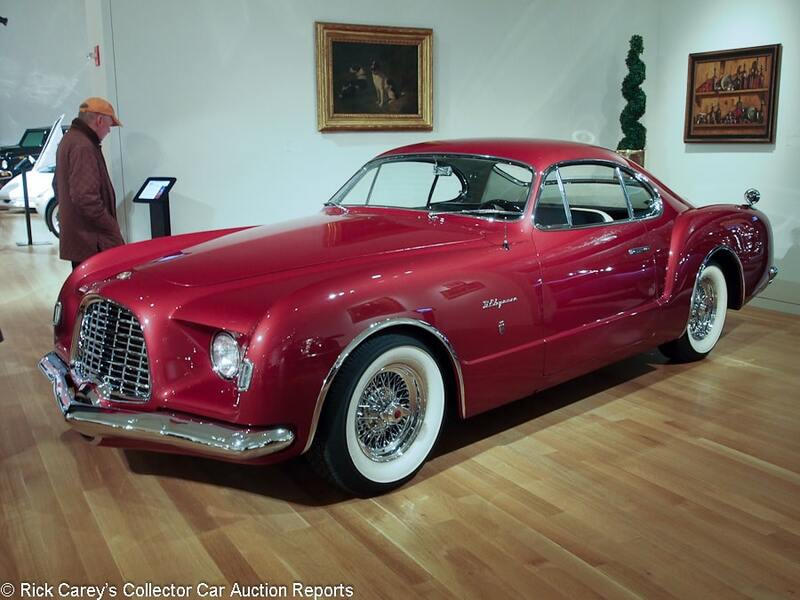 Lot # 128 1952 Chrysler D’Elegance Coupe, Body by Ghia; S/N 321953; Ruby Red/Black, White leather; Estimate $900,000 – $1,100,000; Older restoration, 2- condition; With Reserve; Hammered Sold at $800,000 plus commission of 10.63%; Final Price $885,000 – 354 Hemi V8, TorqueFlite automatic, chrome wire wheels, wide whitewalls, fitted luggage behind the seats. – Many design and styling details still being emulated today, a Virgil Exner show car of singular influence. Sound older show quality paint, chrome and interior. The underbody and chassis are old and show some road use and age. – Sold at Barrett-Jackson Scottsdale in 2006 after intense promotion for $1,188,000, then by RM in Monterey in 2011 for $946,000. The restoration was freshened thereafter, shown at Amelia Island where it won its Chrysler Concept cars class and subsequently driven. Its design influence can be seen in the Chrysler letter cars’ grilles and even scaled down in the Karmann Ghia. The gunsight taillights show up, unfortunately, in later Imperials. The result here is appropriate for the D’Elegance’s influence, design and condition. 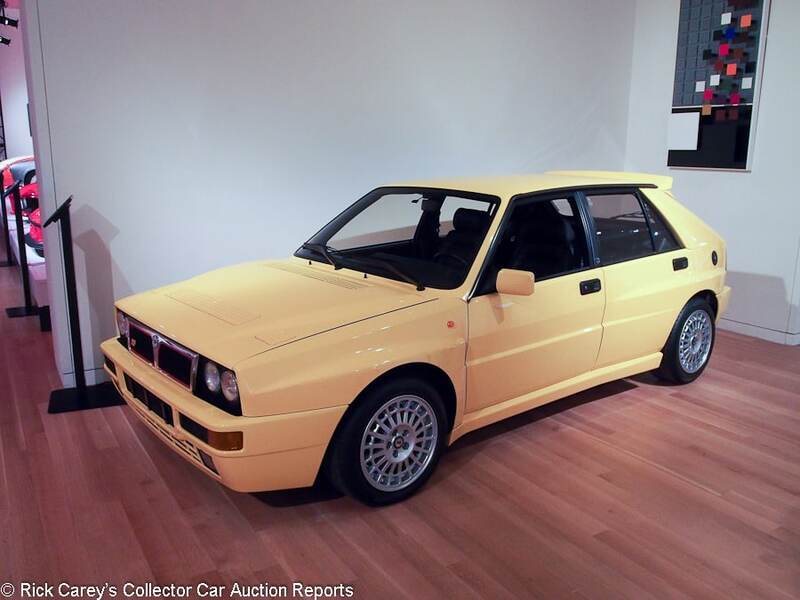 Lot # 129 1992 Lancia Delta HF Integrale Evoluzione Rally Sedan; S/N ZLA831AB000576428; Mustard Yellow/Black leather; Estimate $175,000 – $225,000; Unrestored original, 2- condition; No Reserve; Hammered Sold at $170,000 plus commission of 12.00%; Final Price $190,400 – A/C, alloy wheels, Hankook tires. – Mediocre factory paint, good interior. One owner and nearly like new with 6,511 km from new. – One of 400 homologation versions in this color which the catalog calls ‘Ferrari Fly Yellow’ but is not as vibrant a hue as that. Celebrated by informed collectors of Group A Rally Cars, in immaculate, original condition and comfortably equipped, it represents full value for the money in this transaction. 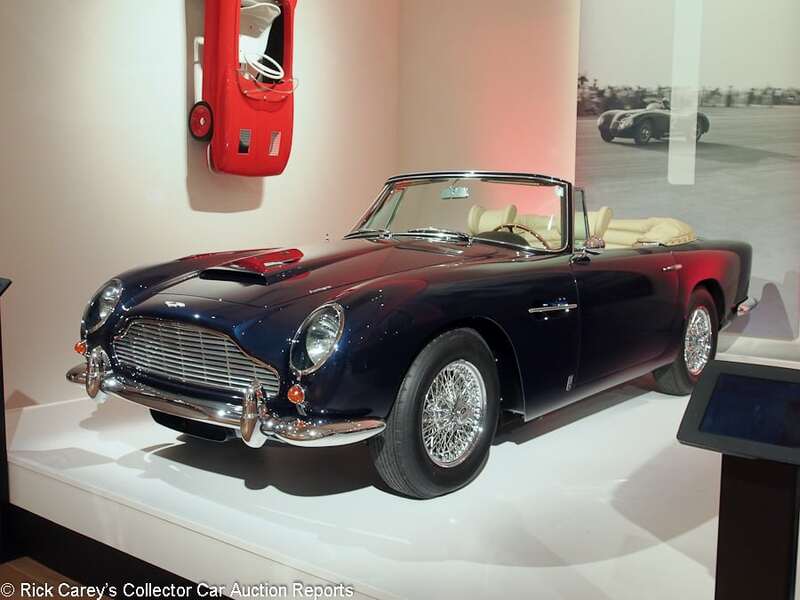 Lot # 130 1965 Aston Martin DB5 Convertible; S/N DB5C1923L; Engine # 400/2075; Metallic Midnight Blue/Fawn leather; Blue cloth top; Estimate $2,450,000 – $2,650,000; Recent restoration, 2+ condition; With Reserve; Hammered Sold at $2,450,000 plus commission of 10.20%; Final Price $2,700,000 – Blaupunkt multiband radio, power windows, air conditioning, woodrim steering wheel with black spokes, chrome wire wheels, Dunlop tires, headrests. – Excellent paint, chrome and upholstery. Driver’s seat cushion is lightly stretched and soiled. The underbody is better than new. Inside the often overlooked window pockets are like new. An impressive and thorough restoration in the mid-00’s by Steel Wings and a multiple award winner. – Impressively priced, too, only the second DB5 Convertible to break $2 million and by over $500,000 the most expensive of its kind ever sold at auction, but it is impossible to fault in any meaningful way and its result here is a strong inducement for the other LHD DB5 Convertible owners to freshen their cars and put them up for sale. 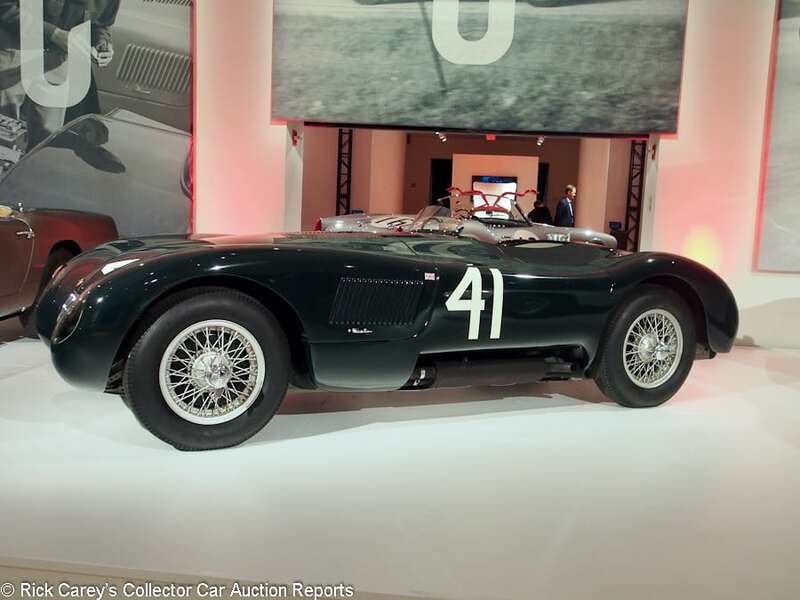 Lot # 131 1952 Jaguar C-Type Sports Racer; S/N XKC 007; Engine # E1009-9; BRGreen/Brown leather; Estimate $5,500,000 – $7,000,000; Competition restoration, 2 condition; With Reserve; Hammered Sold at $4,800,000 plus commission of 10.10%; Final Price $5,285,000 – RHD. Silver painted wire wheels, half width low Plexiglas windscreen with aeroscreens, side exhaust, RetroTrip rally odometer. – The first C-type delivered to the U.S. where California dealer Charles Hornburg put it in the hands of a young Jaguar mechanic and driver recently returned from a factory orientation in Coventry, Phil Hill. Hill won the Sheldon Cup at Elkhart Lake, placing 4th overall and 1st in class in the main event. Later owned and raced by Carlyle Blackwell, Jr. Restored by Terry Larson in the mid-80’s to JCNA winning standards. Excellent paint and upholstery. Original engine with original C-type head included. Better than new but now showing a little age but not much use. Comes with its original seats and tool roll. – Sold by RM at Monterey in 2009 for $2,530,000, the top transaction of the sale and obviously the recipient of much recent cosmetic attention, a car that has a history of caring and often long-term ownership by informed collectors who gave it what it needed when it needed it and never fell into disrepair nor suffered on-track embarrassment. It never raced at Le Mans or in the Mille Miglia (until it did the MM Storica in 2010) but it has a notable U.S. race history starting with Phil Hill. It is an exceptionally good and historic C-Type at a realistic price. 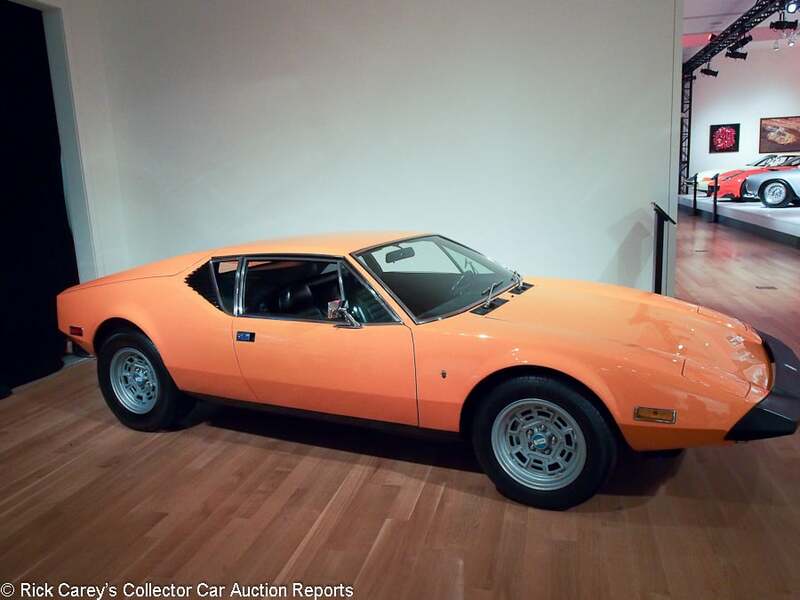 Lot # 132 1973 De Tomaso Pantera L Coupe; S/N THPNNR05756; Orange/Black vinyl; Estimate $125,000 – $175,000; Unrestored original, 3+ condition; No Reserve; Hammered Sold at $130,000 plus commission of 12.00%; Final Price $145,600 – Edelbrock intake, Holley carb, new aluminum radiator and water pump, Campagnolo Pantera alloy wheels, comes with the original Arriva tires, tool kit, books, spare (with air canister) and luggage tray. – Very good original paint, chrome and interior except for a repainted nose. The original Zeibart rust retardant has been removed and the underbody and engine compartment painted over but intact. Four owners from new, 12,145 miles. A Ford test car first sold to a Ford executive. – Most Panteras have succumbed to the ease with which they’re modified and the attraction of flares, wings and air dams not to mention chromed-out engines and gaudy wheels. While this Pantera is modified the changes are effectively invisible and its preservation is nothing short of miraculous, an important fact noted by the bidders here at Sotheby’s and reflected in the superior price it brought. 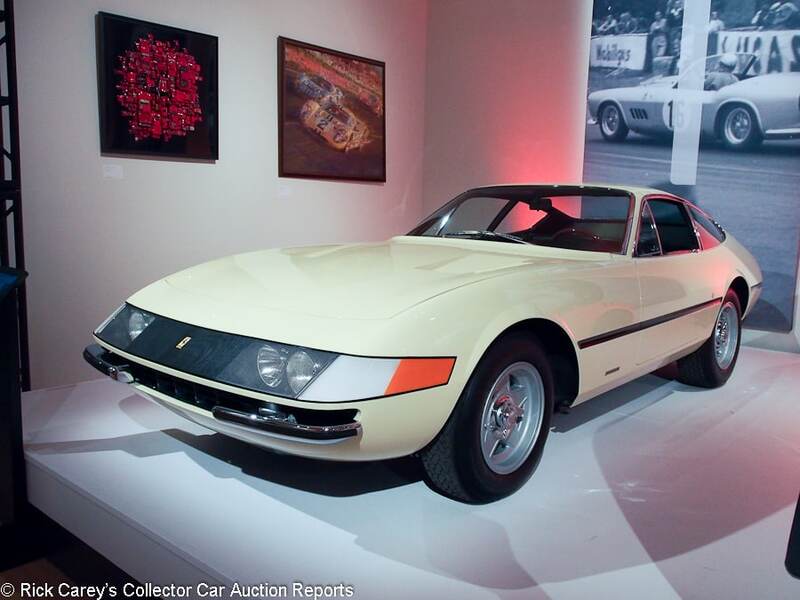 Lot # 133 1969 Ferrari 365 GTB/4 Daytona Berlinetta Prototype, Body by Pininfarina; S/N 12301; Engine # B88; Giallo Dino (Light Yellow)/Black leather, Blue inserts; Estimate $1,400,000 – $1,700,000; Recent restoration, 2+ condition; With Reserve; Not sold at Hammer bid of $1,250,000 – Plexiglas nose panel, 5-spoke alloy wheels, Michelin XWX tires, Voxson 8-track stereo, power windows, Euro spec engine. Ferrari Classiche certified, books and tools. – The first production (or final prototype) Daytona and first U.S.-spec Daytona, distinct in many details. Displayed at the New York Auto Show in March 1969 and at LA in both ’68 and ’70. Delivered to Greg Garrison at the factory. Restored in 2009. Chipguarded nose. Very good paint, chrome and interior. Lightly sand chipped windshield. The underbody is like new as is the engine compartment. Restored like new. FCA Platinum (twice). – This isn’t an ordinary Daytona, so it isn’t an ordinary Daytona bid and even that wasn’t enough to separate it from its owner. Would another $50K bid have done it? Based upon the way the auctioneer worked at getting a bump above this bid it would seem likely. 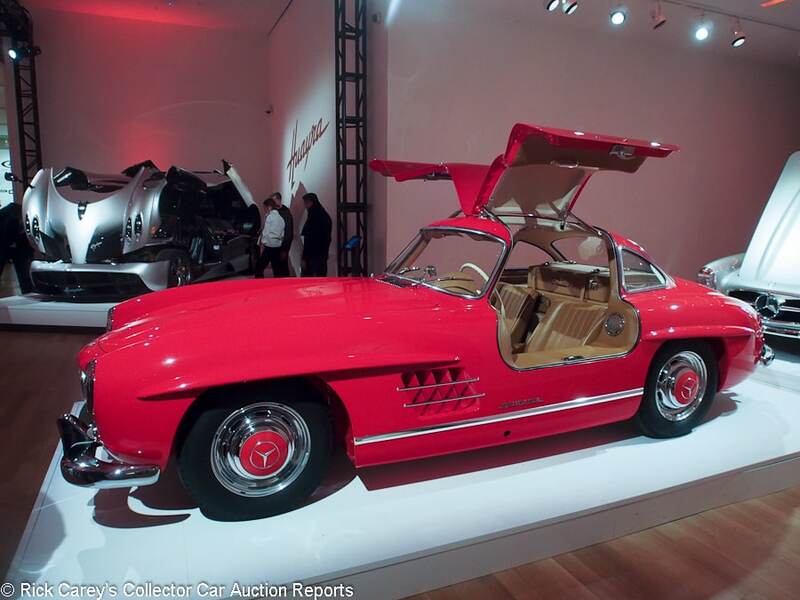 Lot # 134 1955 Mercedes-Benz 300SL Gullwing; S/N 1980405500593; Fire Brigade Red/Tan leather; Estimate $1,300,000 – $1,500,000; Recent restoration, 2 condition; With Reserve; Hammered Sold at $1,225,000 plus commission of 10.41%; Final Price $1,352,500 – Chrome wheels, hubcaps, 185VR15 Pirelli tires, hinged Ivory steering wheel, fitted luggage, Becker Mexico radio, full belly pans, tools and tool bag. – Very good color changed paint from the original Medium Blue with some polishing scuffs. Lightly stretched upholstery also color changed from the original Light Grey leather. Underbody and engine compartment are like new but the engine compartment is a bit dirty on the firewall. Restored in the 90’s by Hjeltness Restorations and still impeccable today. – This is an exceptional Gullwing which has been maintained in as-restored condition with no evidence of any use for two decades. It’s time for it to go to someone who will actually use it and at this price it can be used with pride and confidence. 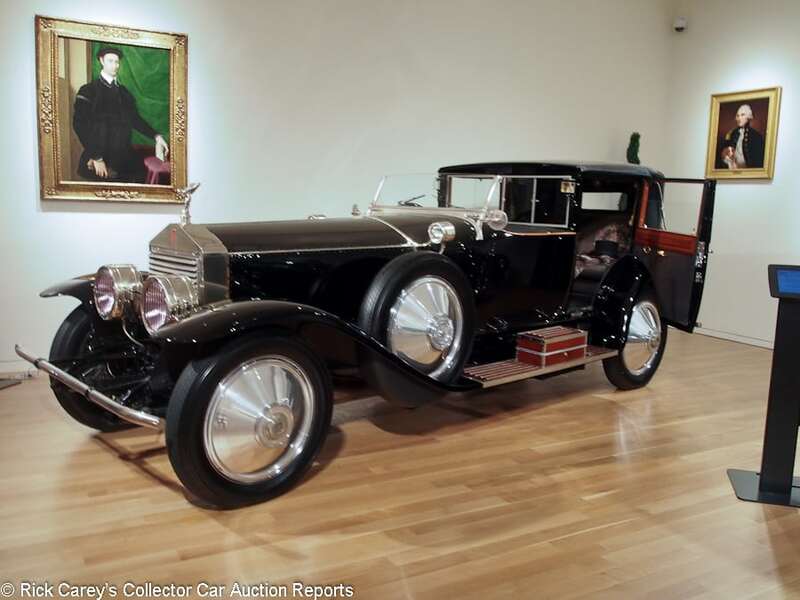 Lot # 135 1923 Rolls-Royce Silver Ghost 40/50hp Town Car Riviera, Body by Brewster; S/N 390XH; Engine # 21215; Black, Black leather roof/Black leather, Charcoal Grey cloth; Estimate $500,000 – $700,000; Visually maintained, largely original, 3 condition; No Reserve; Hammered Sold at $275,000 plus commission of 11.82%; Final Price $307,500 – RHD. Polished wheel discs, blackwall tires, dual sidemounts, Bausch & Lomb drum headlights and cowl lights, folding windshield, leather covered trunk, sliding division, inlaid wood, gold plated hardware, vanity, Jacquard design woven into the cloth of the rear seat backs, jump seats, gold coachlines. – Believed to be the only Riviera Town Car bodied by Brewster on the Silver Ghost chassis, the other nine being on Phantom chassis. Built for Augustine Leftwich Humes, later owned by Dr. Erle M Heath, later to golfer Gene Littler. Best in class at Amelia Island in 2012, displayed at Pebble Beach in 2013. Sound older paint, chrome and interior but aging everywhere. Cracking leather on the front seatback, new driver’s seat cushion. Very good rear compartment upholstery, wood and hardware. Elegant coachwork. Never restored, beautifully maintained and in very good condition. – Crossed the Barrett-Jackson block in 2015 where it was reported bid to $605,000. Offered here without reserve, it sold for a surprisingly modest price, barely half the reasonable low estimate, a disappointment for the seller but an extraordinary value for the new owner who is going to look grand descending from the opulent rear compartment with pockets stuffed with wads of greenbacks saved in this transaction. 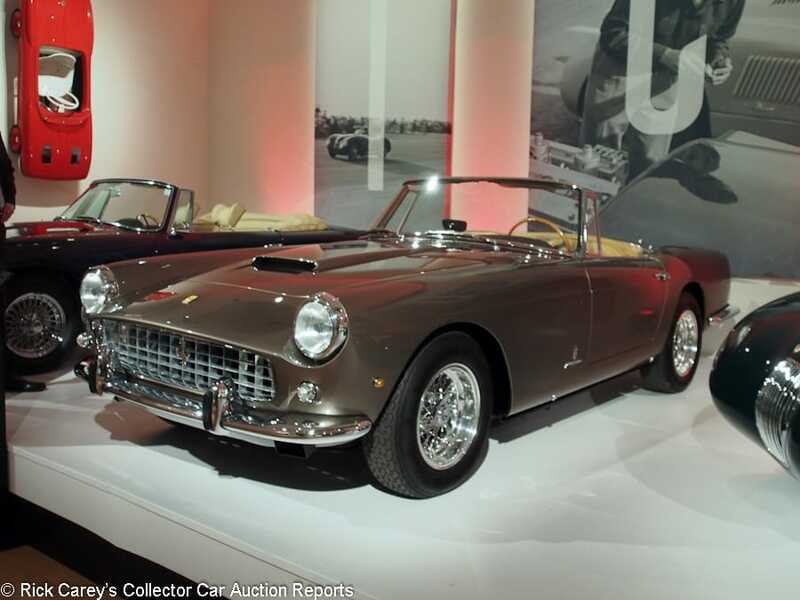 Lot # 136 1961 Ferrari 250 GT Cabriolet SII, Body by Pininfarina; S/N 3009GT; Engine # ‘3009’; Grigio Ortello (Metallic Grey)/Beige leather; Black cloth top; Estimate $1,500,000 – $1,800,000; Recent restoration, 2+ condition; With Reserve; Not sold at Hammer bid of $1,300,000 – Chrome spoke Borrani wire wheels, Michelin XWX tires, no radio, Halogen headlights, Marchal fog lights behind the grille. – Excellent paint, chrome and interior. The underbody is like new. Paint is lightly scuffed on the rear deck where the top mounts. Excellent gaps and fits. Saleroom notice: ‘According to Ferrari build sheets, this car is equipped with a correct type motor and rear end from a different car. 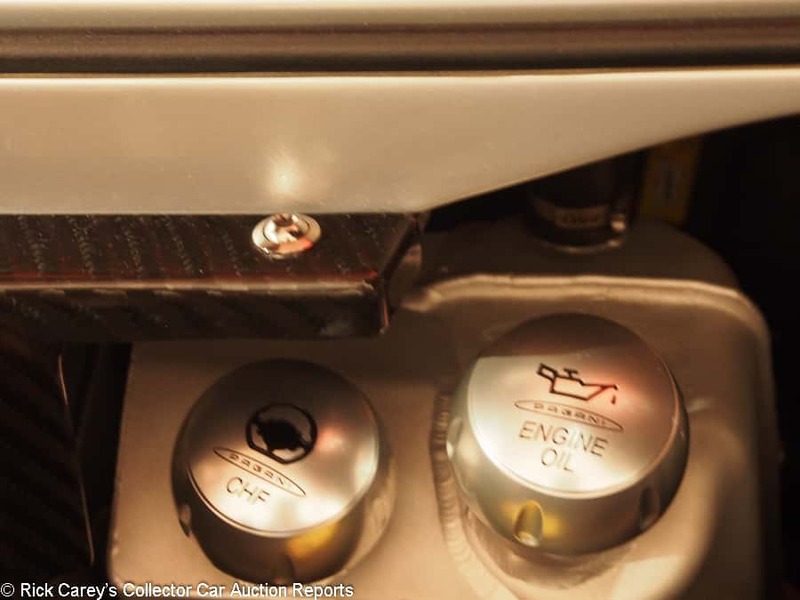 However, it should be noted the motor has been stamped to match the car’s chassis number.’ – Bidding on this lot was perfunctory after disclosure of the restamped engine and there was no real interest in it on such short notice. 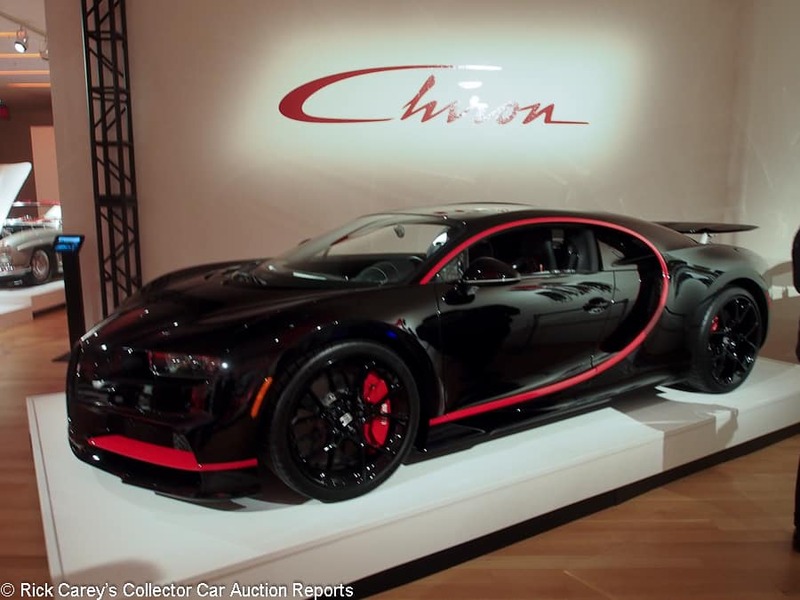 Lot # 137 2018 Bugatti Chiron Coupe; S/N VF9SP3V3XJM795069; Black, Red accent/Black, Red leather; Estimate $3,500,000 – $4,000,000; Unrestored original, 2 condition; With Reserve; Hammered Sold at $3,425,000 plus commission of 10.15%; Final Price $3,772,500 – The first U.S.-spec Chiron ordered, 7,993/1500hp quad turbocharged W-12, 7-speed dual clutch paddle shift transmission, speed limited to 261mph out of respect for the wheels and tires. Comes with factory accessories and includes a day visit to the factory and ride with a factory test driver. – Never registered, brand new, approximately 250 factory test miles. In a subtle distinction, this car is described as the ‘very first Chiron ordered for the U.S. market’, not the first one delivered. Still under factory warranty. – Hammered sold at about half a million dollars over the MSRP (not that MSRP means much in cases like this), an expensive way to go the head of the delivery queue but for those who have serious ‘must have it’ urges and really deep pockets an amount that isn’t unprecedented. 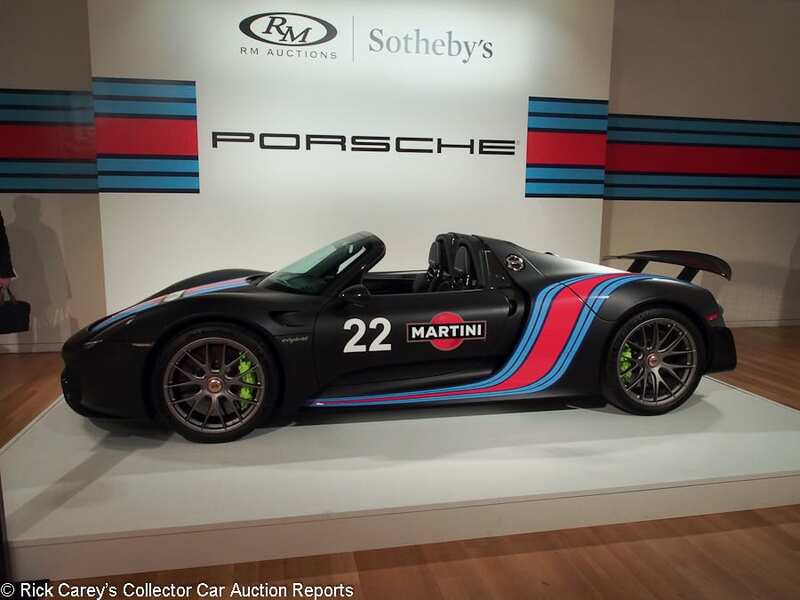 Lot # 138 2015 Porsche 918 Weissach Spyder; S/N WP0CA2A16FS800652; Matte Black, Martini/Black Alcantara; Estimate $1,700,000 – $1,900,000; Unrestored original, 2 condition; With Reserve; Hammered Sold at $1,570,000 plus commission of 10.32%; Final Price $1,732,000 – Metallic Oryx White under the wrap. Acid Green calipers, 887 all-in hybrid horsepower, 7-speed dual clutch paddle shift transmission, front axle lift, low-glare interior, climate control, Homelink. – Like new, one owner, 270 miles. One of approximately 230 Weissach lightweights built. Recently serviced. – Priced at just under $1 million at the factory, the result here is in line with other transaction results for the 918 Weissach. 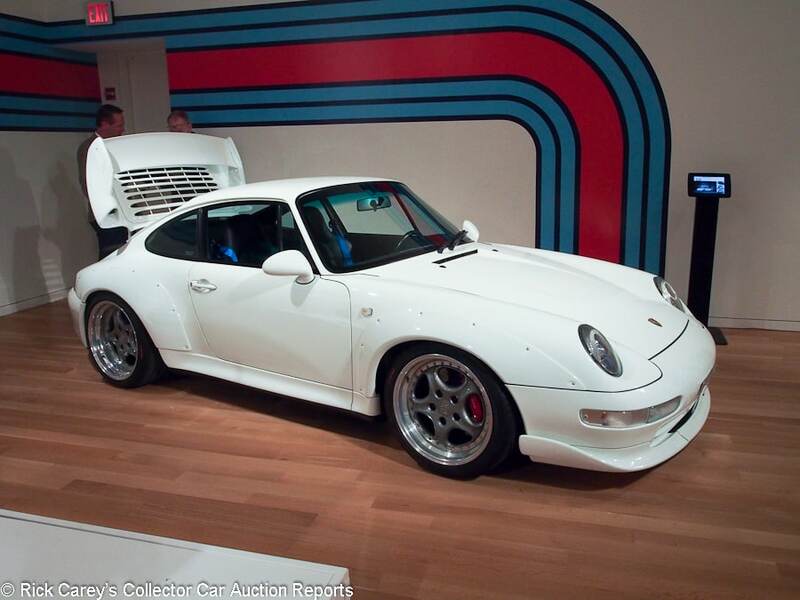 Lot # 139 1996 Porsche 911 GT2 Coupe; S/N WP0ZZZ99ZTS392127; White/Black leather, Grey inserts; Estimate $1,100,000 – $1,400,000; Unrestored original, 2 condition; With Reserve; Not sold at Hammer bid of $950,000 – Grey painted magnesium center Speedline modular wheels, PZero tires, red calipers, McIntosh CD stereo, air conditioning, power windows, tinted windshield, front airbags, tool roll, jack, air compressor, space-saver spare. – Delivered in Japan. Very good original paint, chrome and interior. Lightly stretched seat cushions are the only visible evidence of use. Speedometer has been repaired, rendering the odometer reading unreliable. Essentially like new. – Perhaps put off by the odometer issue, bidding stopped short of the 7-figures usually fetched by nearly pristine 911 GT2s. 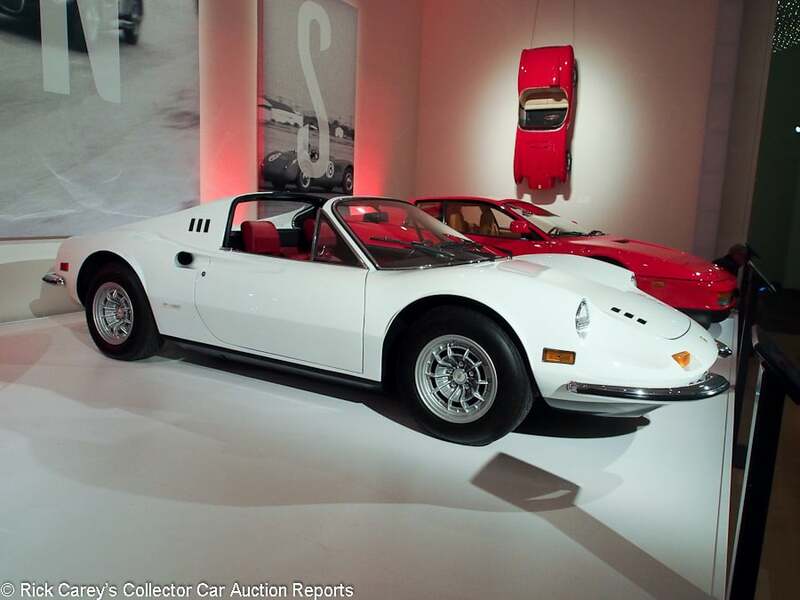 Lot # 140 1974 Ferrari Dino 246 GTS Spider, Body by Pininfarina-Scaglietti; S/N 08500; Engine # 12066; White/Red leather, Black bars; Estimate $500,000 – $600,000; Older restoration, 2 condition; With Reserve; Not sold at Hammer bid of $480,000 – Daytona headrest seats, Campagnolo alloy wheels, Michelin XWX tires, Becker Grand Prix AM-FM, Borletti air conditioning, power windows, Ferrari Classiche certified. – Very good older paint, lightly stretched upholstery. Freshly painted wheels. Decent chrome. Restored in 2013 in the original colors with a new interior, original engine. Recently detailed and serviced at a reported cost of $100,000. A pristine ‘Chairs and Flares’ Dino. – Sold by RM at Monterey in 2013, fresh from restoration, for $390,500. If the next owner did spend $100K on detailing and servicing accepting this bid would be painful but the bid itself is entirely reasonable for the car. It is so close to the low estimate it is hard to understand how RM couldn’t assemble a deal off the block. But, sometimes sellers want what they want if only to satisfy their egos (or justify spending $100,000 on a car that was already in very good condition) and there’s no movement on the reserve. Now this Dino is shopworn, never a good situation. 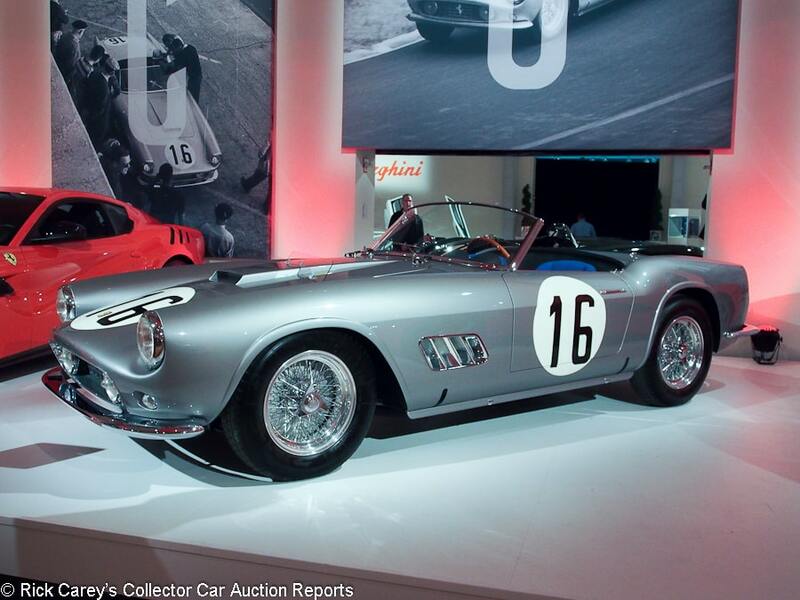 Lot # 141 1959 Ferrari 250 GT LWB California Spider Competizione; S/N 1451GT; Engine # 1451GT; Silver/Blue cloth; Black cloth top; Estimate $14,000,000 – $17,000,000; Recent restoration, 2 condition; With Reserve; Hammered Sold at $16,350,000 plus commission of 10.03%; Final Price $17,990,000 – Chrome spoke Borrani wire wheels, Michelin 6.00×16 Pilote X tires, Plexiglas bug deflector, Marchal head and driving lights, quick release outside fuel cap, carburetor cold air tray, alloy body, 40mm Webers, TR cams, oil cooler, uprated suspension. 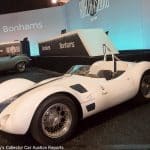 – This is Bob Grossman’s and Fernand Tavano’s 1959 Le Mans car which finished fifth overall, a masterful accomplishment for both the car and its drivers, a prepared California, no less, but one that ran with the giants. Raced by Grossman in the U.S. after Le Mans, winning at Nassau where the alloy bodied California Spider was hard to better. Excellent recent repaint in the original color. Bright but lightly scuffed windshield frame chrome. Underbody is like new, as is the engine compartment. – When sold by RM at Monterey in 2007 for $4,950,000 this was a very good car, but it has had a full Motion Products restoration in the original colors since, as well as adding 5,736 kilometers to its odometer, almost 3,500 miles. It’s a better car but the owner has gotten some enjoyment from the effort put into it. Disregarding the cost of the attention it received, the annually compounded rate of return since it last changed hands is over 12.7%. It was the object of a protracted and highly enjoyable bidding contest between a bidder in the room and another dealing through a representative on a cell phone standing at the periphery who employed just about every bidding ploy known to experienced bidders to dislodge their competition. The gambits included tiny $50,000 increments when the bidding was over $15 million and several pre-emptive $150,000 bumps to the challenging half-million levels that take some introspection to breach. These were determined collectors and the experience kept the crowd at Sotheby’s engaged and applauding. It was the evening’s high point, as it should have been, and is a marvelous car with a fantastic history, but it was alllll the money for it. 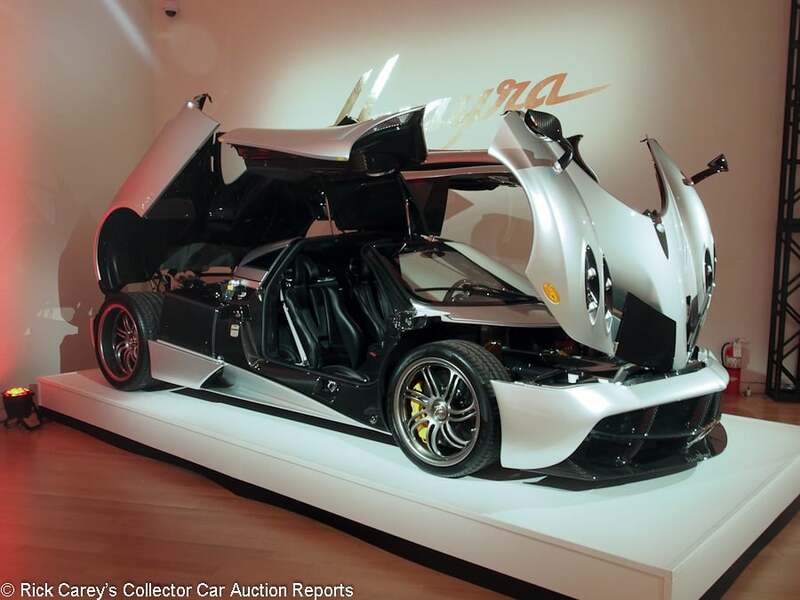 Lot # 142 2014 Pagani Huayra Coupe; S/N ZA9H11UA3ESF76078; Silver, Black Carbon Fiber/Black; Estimate $1,900,000 – $2,300,000; Unrestored original, 2 condition; With Reserve; Hammered Sold at $1,676,818 plus commission of 10.30%; Final Price $1,849,500 – #78 of 100. 720hp twin turbocharged Mercedes-AMG V12. – One owner, 4,943 miles from new and in showroom condition. The elaborate details on this Huayra, particularly the interior and instrument cluster, are in questionable taste and challenged in utility but exquisitely done. It is the only car this observer has ever seen that has a filler cap for Swiss Francs (yes, a filler cap labeled ‘CHF’), probably appropriate for its cost of ownership and operation. – Bid to $1,800,000 on the block, closed later at this all-in result. Pull into the filling station attached to a branch of Credit Suisse and, ‘Fill it with Super, check the oil and top off the Swiss Francs with a few thousand for the trip to Nice.’ As much an art object as an automobile it would have been appropriate for Sotheby’s Contemporary Art sale last month, perhaps more appropriate than the highly utilitarian Ferrari F2001. 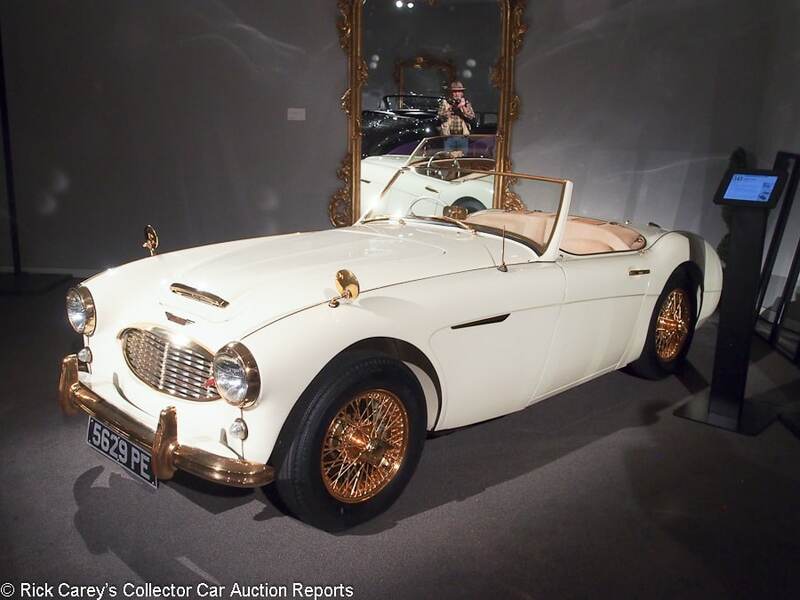 Lot # 143 1958 Austin-Healey 100/6 “Goldie” Roadster; S/N BN62260; Engine # 26DUH66988; Ivory/Champagne leather, mink fur inserts; Estimate $350,000 – $550,000; Older restoration, 3+ condition; No Reserve; Hammered Sold at $160,000 plus commission of 12.00%; Final Price $179,200 – RHD. Gold plated wire wheels and all bright trim, ivory overlaid steering wheel, beige carpets, fender mirrors, pushbutton radio, heater, ivory shift knob, 4-wheel power disc brakes, overdrive. – Displayed at Earls Court in 1958. Restored in 1986 to as-displayed condition. Excellent older paint and interior. Gold plated trim is older and dull, wheels are fresh and crisp. Ivory is aging and cracked. Restoration shows a little age but no appreciable use. 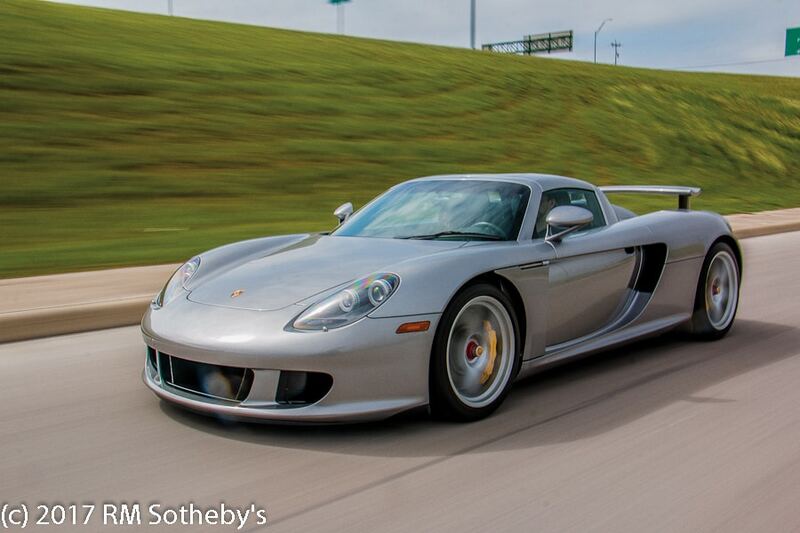 – Offered at Worldwide’s Houston auction in 2013. Offered here without reserve. It’s more of a curiosity than an automobile. RM and the consignor sought to create a value halo for it with the optimistic estimate range but the result it brought here adequately recognizes its unique character and meticulous restoration. 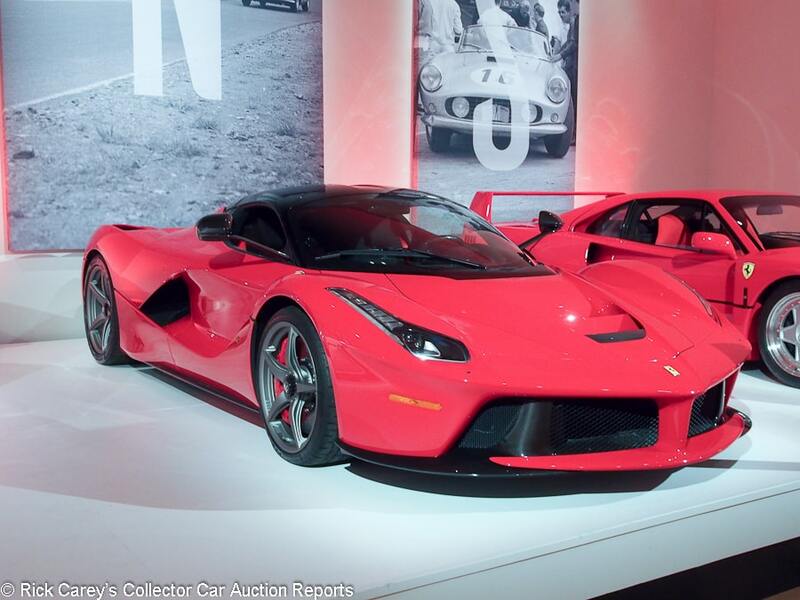 Lot # 144 2014 Ferrari LaFerrari Berlinetta; S/N ZFF76ZFA3E0204687; Red, Black roof/Black Alcantara; Estimate $3,250,000 – $3,750,000; Unrestored original, 2 condition; With Reserve; Not sold at Hammer bid of $2,700,000 – Red calipers, matte grey alloy wheels, carbon fiber outside mirrors and interior trim. – Unblemished and like new, represented to have just 53 miles from new. – LaFerraris are becoming nearly ubiquitous at auctions as their owners free up garage space and liquidity for the Apertas that they have ordered. Supply and demand are at work and the prices are slowly declining but even in that environment the high bid here is far short. Mileage is sort of irrelevant: since most have well under a thousand miles the difference between 530 miles and 53 miles is insignificant. Lot # 145 2004 Porsche Carrera GT; S/N WP0CA29814L001158; Silver/Charcoal Grey leather; Estimate $775,000 – $850,000; Unrestored original, 2 condition; With Reserve; Not sold at Hammer bid of $700,000 – Yellow calipers, chipguarded everywhere, original documents, keys, manuals, luggage, etc. – Like new, never registered, 695 miles and still on the factory MSO. Engine out serviced in July 2015 at a cost of over $26,000, despite having essentially no miles since delivery. – The consignor reasonably expects a premium for this sub-1,000 mile Carrera GT, but the reported high bid here includes a reasonable premium for its nearly undriven condition and showroom condition. The difference between a 695 mile Carrera GT and a 6,950 mile one is related almost solely to the digits showing on its odometer: all of them are pristine and immaculate. So, too, the difference between their values. Lot # 146 1990 Ferrari F40 Berlinetta; S/N ZFFMN34AXL0087144; Red/Red cloth; Estimate $1,200,000 – $1,400,000; Unrestored original, 2- condition; With Reserve; Hammered Sold at $1,125,000 plus commission of 10.44%; Final Price $1,242,500 – Assembly No. 04123. U.S. spec car with non-adjustable suspension, books, tool kit, car cover, clean CarFax. – Chipguarded nose and outside mirrors. Paint chips and scrapes in the engine compartment. Upholstery has been replaced and is unworn but showing age. Serviced at 8,017 miles (the odometer now shows 8,079). 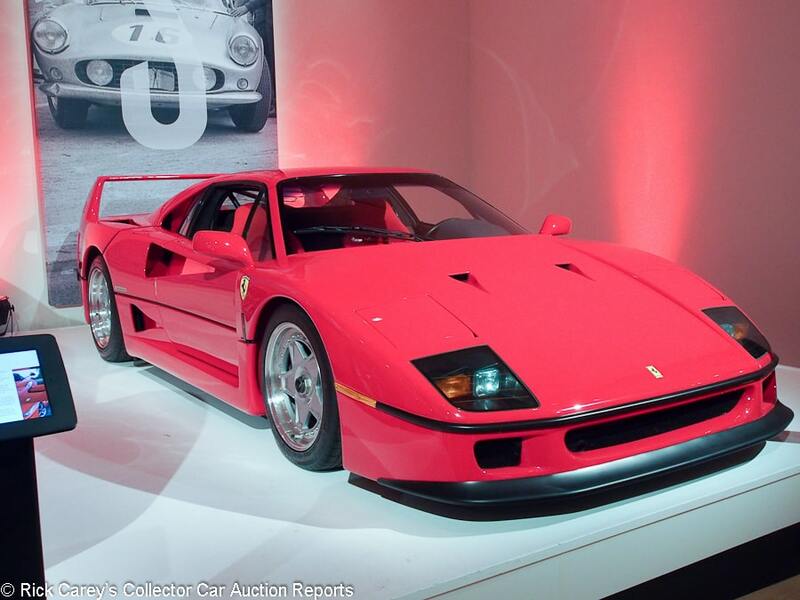 – This is an entirely reasonable price for a lightly used F40 with these miles and in this condition. 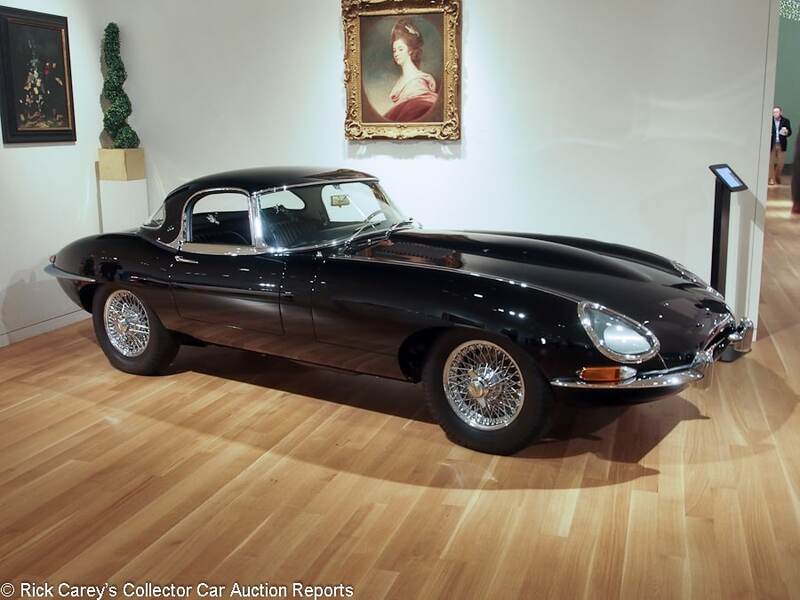 Lot # 147 1966 Jaguar XKE SI 4.2 Roadster; S/N 1E13575; Engine # 7E10377-9; Black, Black hardtop/Black; Black leatherette top; Estimate $250,000 – $325,000; Recent restoration, 2+ condition; No Reserve; Hammered Sold at $210,000 plus commission of 12.00%; Final Price $235,200 – Chrome wire wheels, two tops, Blaupunkt multiband radio, books, tools, jack, hammer, JDHT Certificate – Freshly restored and better than new. Documented quadruple black as delivered. Restored in the Naughts to its present showroom condition with better paint. – Sold by RM at Monterey in 2015 for $319,000 and still in show-quality condition, the result here is appropriate for the car and its condition but perhaps a little shy of its 2-top, all-Black presentation. Both the buyer and the seller should be satisfied with this result. 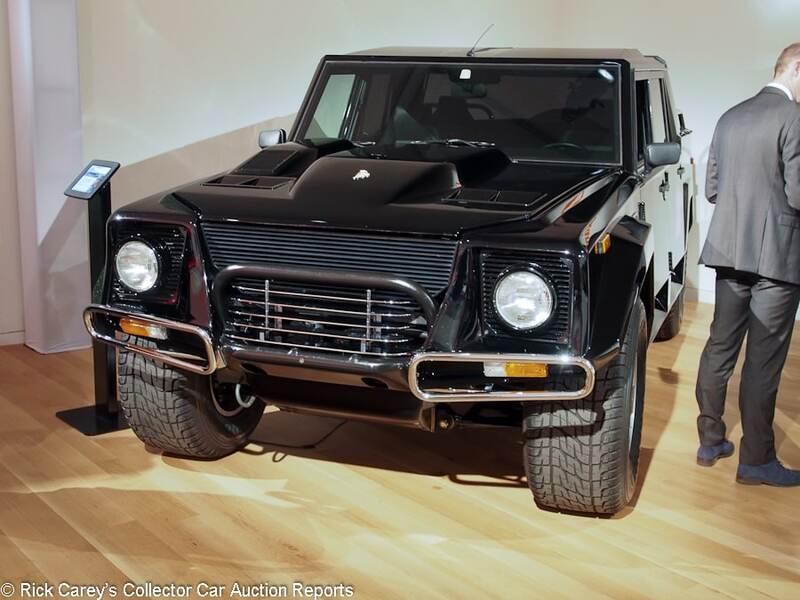 Lot # 148 1990 Lamborghini LM002 America Utility; S/N ZA9LU45A2LLA12186; Black/Black leather; Estimate $400,000 – $500,000; Recent restoration, 2- condition; With Reserve; Hammered Sold at $420,000 plus commission of 11.19%; Final Price $467,000 – Black leatherette bed and spare tire cover, tubular bed rails, chrome tubular bumperettes, Pirelli Skorpion tires, Alpine stereo. – One of a reported 48 built to U.S. specs. Fresh, thick repaint lifting in body creases behind the right rear door and above the fender flares. Chassis and engine are restored like new. Very good interior. Freshly done but flawed. 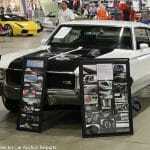 – This is a stupendous price for an LM002A, a hundred thousand dollars more than any comparable example. The repaint is sufficiently flawed in detail to call into question the quality of the workmanship in general and the new owner paid dearly for it. 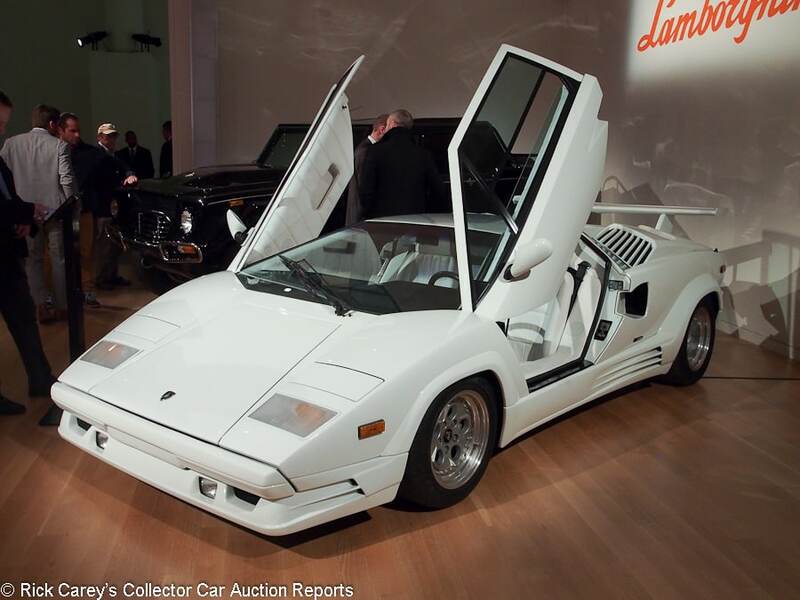 Lot # 149 1989 Lamborghini Countach 25th Anniversary Coupe; S/N ZA9CA05A2KLA12608; White/White leather; Estimate $200,000 – $250,000; Unrestored original, 2- condition; No Reserve; Hammered Sold at $240,000 plus commission of 12.00%; Final Price $268,800 – Alpine CD stereo, modular telephone dial wheels, PZero tires, wing. – 15,708 km and looks like it. Seats have been sat in, paint is lightly swirled, repainted window frames. The underbody is clean and original. Serviced this year with new brakes, fluids, filters, belts, air conditioning, new Alpine stereo and hood and door struts. – An exceptionally good Anniversary Countach that has never fallen into neglect and has recently been comprehensively serviced so the new owner should feel confident in its condition and usability. 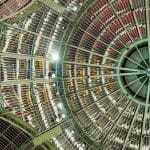 The price it brought here, even mid-estimate, is reasonable for its condition. 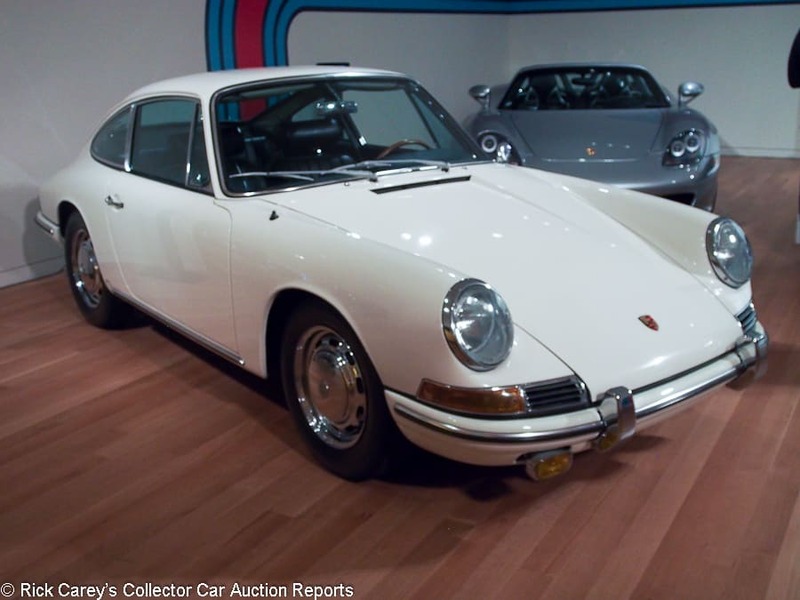 Lot # 150 1966 Porsche 911 Coupe; S/N 302596; Engine # 912429; White/Black leather; Estimate $250,000 – $300,000; Older restoration, 3+ condition; With Reserve; Not sold at Hammer bid of $200,000 – Air conditioning, Blaupunkt multiband radio, chrome wheels, Michelin XZX tires, Webasto heater, headrest seats, seat belts tools, jack, power antenna, tinted glass, Koni shocks, original sales invoice documented. – Good older repaint, chrome and interior. Water spots on the hood. Thin chrome on the vent window frames. Good underbody showing some road use. A sound, usable driver quality early 911, with its original owner until 2012. – A delightful old car with a rare list of as-delivered options and accessories. Maintained consistently throughout its life and apparently un-infected by tin worm, it is a fine example, a fine example for which a handsome price was offered in this bid. The early short wheelbase 911 bubble has deflated and the reported high bid is appropriate today. Lot # 151 1953 Piaggio Ape Calessino Scooter; S/N AB1T9401; Metallic Green, Varnished wood/Black, Brown; Beige cloth top; Estimate $50,000 – $80,000; Recent restoration, 2- condition; No Reserve; Hammered Sold at $38,00 plus commission of 20.00%; Final Price $45,600 – Good paint chrome and upholstery. Very good matte varnished wood which appears to be new, as does the top. Not concours, but very good. – 20% BP; the actual successful hammer bid was $38,000. Sold to the same bidder number as the 250GT LWB California Spider Competizione, which is an odd couple if there ever was one. 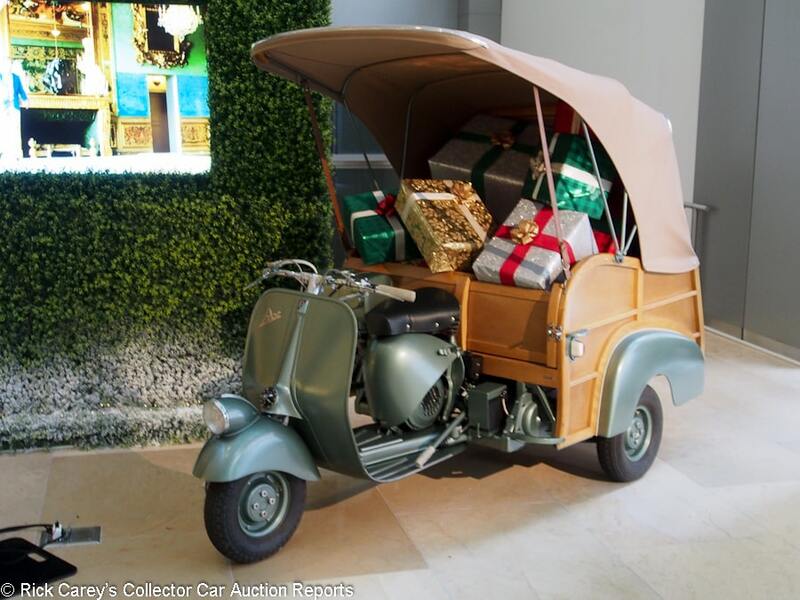 This is a landmark result for a scooter with wooden 2-seat passenger coachwork that looks like a motorized pedicab. Lot # 55 2001 Ferrari F2001 Formula 1; S/N 211; Red, White/Black; Estimate $4,000,000 – $5,500,000; Competition car, original as-raced, 2- condition; With Reserve; Hammered Sold at $6,700,000 plus commission of 12.00%; Final Price $7,504,000 – Driven by Michael Schumacher to win Monaco and Hungary. Also used for practice (usually by Luca Badoer) at Barcelona, Montreal, the Nürburgring, Magny-Cours, Spa and Monza. Used in the Corse Clienti program, displayed since 2006 and unused so a trip back to Maranello is essential before it’s fired up. Marlboro identification removed to comply with current FIA rules. – A little brand-positioning by RM Sotheby’s to introduce a famous car into the contemporary art scene, an experiment that proved to be resoundingly successful, bringing an extraordinary price well above the pre-sale high estimate. Bidding was serious and reasonably fast-paced; the eventually buyer turned out to be a new client previously unknown to either RM or Sotheby’s, a fact that may be even more important than the price paid, showing the draw and attraction that this car and its extensive promotion had. Nothing in this auction compares to the grandeur of the plum red and black Phantom II, featured in the current Classic & Sportscar issue, and the other grand routier (Talbot-Lago or Delage?) in the 2013 auction. Rick’s comments are much more interesting than the cars this year. 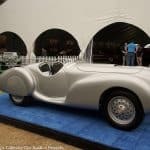 It was a 1936 Delahaye 135 Competition SWB with Figoni & Falaschi Teardrop Coupe coachwork, sold for $2.2 million hammer, $2,420,000 with commission. 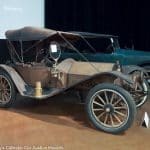 The Rolls (Freestone & Webb Sports Coupe coachwork) brought the same price. And, yes, the docket this year was much different in character.